Seeing the actual amount of support for health care reform among my colleagues, I just laughed when I saw this report on of a poll from Investors’ Business Daily which claims that 45 percent of doctors would consider quitting if health care reform passed. I took this as yet another example of how the right wingers manage to pull fiction out of their asses and claim it to be fact, and how right wing bloggers will jump upon any claims which support their biases. After all, Investors’ Business Daily is also the site which had a poll showing that McCain would win the youth vote by a margin of 74 percent to 22 percent. As with any group, the views of physicians are not monolithic. There are some doctors who remain apprehensive about health care reform and fear a potential loss in income. Many of these are also influenced by the same right wing distortions which drive other opposition to health care reform. A handful even agree with the physicians of the 1960’s who opposed the formation of Medicare. It wouldn’t be hard to devise a poll (especially one done by mail as in this case) using leading questions (as this poll did), to come up with a number of doctors sending back a mail in survey opposing reform. There is widespread recognition of the need for reform among many physicians. Those of us who actually deal with a combination of government programs such as Medicare and private insurance companies have found that the government is easier to deal with, more reliable in sending payments without hassle, and is far less likely to meddle in our medical decisions than private insurance companies. Medicare never drops anyone’s coverage because they become too expensive as private insurance companies often do. The support for reform among physicians is also seen in the articles of support which have become quite common in the medical journals. The American Medical Association and several other medical organizations have endorsed health care reform. Just earlier this week, The New England Journal of Medicine published a real survey, as opposed to the bogus one conducted by Investors’ Business Daily, which showed that over seven out of ten doctors support having a public option. So much for claims that doctors oppose government involvement in paying for health care. The results of the poll from Investors’ Business Daily simply fail to pass the smell test–and looking at their shoddy methodology shows why. The reviewers have agreed with me in not being impressed with Jay Leno’s new show. The ratings have been good, as would be expected by from people tuning in initially to decide if this is worth watching and because he was up against reruns, but it remains uncertain as to how NBC will do with this gamble long turn. While this is primarily a question of the ability of the show to continue to bring in viewers, John Nolte at big Big Hollywood turns this into a matter of political ideology. Big Hollywood is the right wing blog which was established to fight what they see as excessive liberal influence on popular culture. They don’t realize that the only way conservatives can win the culture wars is to stop trying to fight living in the 21st century. Having so many conservatives support creationism, foreign policy follies such as Iraq, and a return to shirt hanger abortions is just not going to win over the creative class. While it is also right there in the picture on my post, I hadn’t even noticed that he was wearing a lapel flag. This was totally irrelevant to my impression of the show–and I bet to the impressions of pretty much all television reviewers. 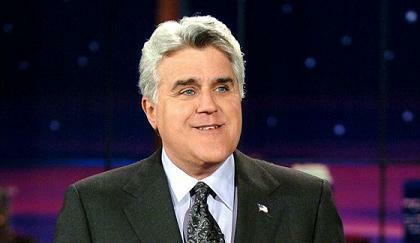 Leno was judged by most based purely on the entertainment quality of the show, not political ideology. I didn’t see his show, but I’m pulling for him because all the right people are not. If John Nolte is so concerned with Leno’s ratings, maybe he should quit wanking about lapel pins and start watching. Are there any history majors out there who can tell me if there ever was a time that one of the major political parties was so concerned with something as trivial as lapel pins? This has been an ongoing obsession of the wingnut crowd for several years now, and it is just downright bizarre.